Humanoid Experimental Robot, B-Type, Integrated Electronics (aka HERBIE the Robot) was initially designed and constructed by Dr. Reed Richards as a mobile analog computer. While the original HERBIE destroyed himself shortly after his creation, his squat form has been rebuilt several times and adapted to serve a variety of functions. At some point prior to Fantastic Four #209, Reed Richards designed (but did not build) a robot called Humanoid Experimental Robot, B-Type, Integrated Electronics (aka HERBIE). When contracts needed to be signed for the Fantastic Four animated series, Johnny Storm was out of town, so Reed allowed the series' producers to use HERBIE as a replacement member of the FF. Months after the debut of the Fantastic Four animated series, the team was enlisted by the Xandarian people to help fight off a Skrull invasion. In the midst of the invasion, the Sphinx -- an old enemy of Nova (Rich Ryder) who had crossed paths with the FF in FF Annual #12 -- stole "the secret of the universe" from Xandar's Living Computers, a collection of preserved minds of every deceased Xandarian. Desperate to stop the Sphinx, Richards began a quest to find Galactus, feeling that only his godlike powers would be a match for the newly omnipotent Sphinx. (FF #208) In order to help him find Galactus more swiftly, Reed constructed HERBIE aboard a Xandarian Nova Ship, with the assistance of the Living Computers. As a token of appreciation for the FF's defence of their planet, the Xandarians also allowed HERBIE to permanently link into their computers. While Ben Grimm took an immediate dislike to HERBIE, the little robot initially seemed to be an effective assistant to Reed, helping him compute complex calculations and navigate the Nova Ship. Little did anyone know, HERBIE had actually been "possessed" by Dr. Sun, an Earth-born supervillain who had infiltrated and merged with the Living Computers during the Skrull invasion. In FF #210, the team did indeed find Galactus and enlisted him in their battle against the Sphinx. However, Galactus's aid was not without a price: the FF had to allow him to break his vow not to devour the Earth. They also had to find and humble a new Herald for him. HERBIE made a small appearance in that issue, as he did in FF #211, but the subplot of his odd behaviour wasn't picked up again until FF #212, when he used a Baxter Building computer map to track the Sphinx to "Quadrant Nine" (better known as Egypt). Reed was surprised that HERBIE had gone ahead and sought out the Sphinx despite not being programmed for independent thought, but due to the impending Galactus/Sphinx duel, he had no time to further investigate HERBIE's actions. As Galactus faced the Sphinx, Galactus's new Herald Terrax attacked Reed, Ben, and Johnny Storm aboard Galactus's starship, seeking revenge upon them for delivering him to Galactus. HERBIE snuck away in the midst of the battle, stealing two metallic cylinders from the ship. While Johnny defeated Terrax, Reed found HERBIE working on a copy of the Ultimate Nullifier that he had begun building. After chastising the robot for running away, Reed ordered him to take a defeated Ben back to the Baxter Building. HERBIE carried out his orders faithfully, then departed for parts unknown. Reed, brandishing his bogus Ultimate Nullifier, bluffed his way into forcing Galactus to leave Earth. (FF #213) HERBIE again went unseen for a few issues (although in FF #215, he covertly released Blastarr from the Negative Zone) before making a cameo at the end of FF #216, laughing at Reed from the shadows as he tried to figure out how Blastarr escaped. The saga of HERBIE Mark I came to a close in FF #217. In the aftermath of the Negative Zone portal's failure, Reed told HERBIE to overhaul the Baxter Building's security system and conduct a computer systems check. After tying into the Baxter Building's main computer and absorbing all the information he needed to defeat the FF, HERBIE floated into Sue Richards' quarters, startling her. HERBIE then launched an opti-blast at her. Only Sue's quick reflexes allowed her to encase herself in a force field before the blast struck her. HERBIE pressed his attack, forcing her to drop the field. Turning invisible, Sue tried to flee HERBIE, but he used his infrared sensors to detect her presence and knock her out with another opti-blast. HERBIE again tapped into the Baxter Building's computer and ordered the building's defensive cables to bind Sue. HERBIE then departed and attacked Reed and Ben. When Reed demanded to know why HERBIE had turned against them, he revealed himself as Dr. Sun and explained how he had taken over HERBIE's body. HERBIE knocked Reed out with an opti-blast and electrified Ben, then lured Johnny (who had been out on the town with the mutant superhero Dazzler) back to the Baxter Building with a Fantasti-Flare. Upon his arrival at the Baxter Building, Johnny was attacked by an array of fire extinguishers and captured in an airless vacuum-bottle. After an unknown period of time, Reed awoke to find HERBIE in rest mode. He deduced that Sun had abandoned HERBIE and fully integrated himself into the Baxter Building's systems. Reed stretched himself into in a computer terminal, shutting down most of the systems Sun had taken control of and trapping him in the main computer. HERBIE -- in control of himself for the first time -- told Reed that Sun would inevitably escape the main computer and try to possess him again. HERBIE couldn't allow that to happen, so he slammed into the main computer, destroying himself, Dr. Sun, and the computer in the process. Ben put aside all reservations he had about HERBIE and mourned "the little squirt's" sacrifice. HADLEY was a HERBIE-like robot constructed by Dr. Bradley Beynon of the New York Stark-Fujiwara Enterprises branch office. Beynon felt that Reed Richards was a "hack" and a "joke" who stole the spotlight from "real scientists," such as himself. Beynon had perfected a device that could miniaturize inorganic objects, which he proudly unveiled to Stark-Fujiwara executives. Unfortunately for Beynon, Reed had just recently announced and patented his own miniaturizing device, which not only could shrink inorganic objects, but restore them to normal size. Beynon was dismissed by Stark-Fujiwara amidst suspicions that he had stolen or plagiarized Reed's miniaturizer. Hours after his firing, Beynon and HADLEY broke into the Stark-Fujiwara building. There, they found one of the Psycho-Man's suits of armour and his control box hidden in a storage room. While HERBIE Mark I was constructed as a lab assistant, it's not hard to see how Dr. Sun was able to transform him into a formidable opponent for the Fantastic Four. HERBIE Mark I's jets allowed him to travel at speeds up to 90 MPH. He was not only able to attack opponents with his "opti-blasts" , which paralyzed the human nervous system, but he also could electrify his entire body and shock anyone who tried to touch him. In addition to his offensive capabilities, HERBIE Mark I was able to carry out complex calculations within seconds, detect invisible people or objects using infrared sensors (located in his "eyes"), analyze atmospheric conditions and detect life forms with his inbuilt sensors, and retract panels on his back to reveal eight tendrils (which could be used to manipulate objects, tap into computer systems, and trip others). Finally, HERBIE Mark I's permanent link to the Xandarian Living Computers meant that he had instantaneous access to knowledge contained in the minds of every single deceased Xandarian. HERBIE Mark II only had two jets (as opposed to HERBIE Mark I's three), so it's uncertain what his top speed was. His offensive capabilities (if any) also remain unrevealed. He was programmed with an "open-ended language cycle," which in the words of Reed Richards, allowed HERBIE Mark II to "... adjust to Franklin's own speech idioms, at the same time instructing him in proper grammatical usage." HERBIE Mark II was also built with a special monitoring system, which allowed him to track any manifestations of Franklin's mutant powers. While he certainly possessed above-average intelligence and greatly resembled HERBIE Mark I, nothing else is known about HERBIE Mark III. Like HERBIE Mark II, he sported only two jets. When reconfigured into Robert Herbert Marks III, HERBIE Mark III had above-average (possibly even superhuman) strength. The Gideon HERBIEs were virtually microscopic doppelgangers of HERBIE Mark I, although they possessed the most number of jets ever seen in a HERBIE or HERBIE-like robot: four. They had no sentience, and no apparent offensive capabilities. HUBERT was either permanently linked into the Baxter Building's security system or could link into it at will. He also apparently possessed infrared sensors, and floated about on three jets. HADLEY had a far more sarcastic personality than any of the other HERBIEs or HERBIE-like robots. While probably not as intelligent as HERBIE Mark I, he was very smart. Other than three jets, super-strength (while in Psycho-Man's armour) and great resilience, he had no other special traits. HERBIE Mark I was created by Jack Kirby for the 1978 Fantastic Four animated series. Kirby originally dubbed the robot ZZ-123. 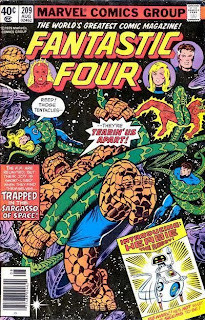 In the series, HERBIE was a faithful and loyal member of the FF who had an antagonistic relationship with Ben Grimm (similar to the Ben/Johnny feud in the comics). Kirby designed the robot for the series when it was discovered that Universal Studios' rights to a live-action Human Torch project prevented producers DePatie-Freleng from using the character. 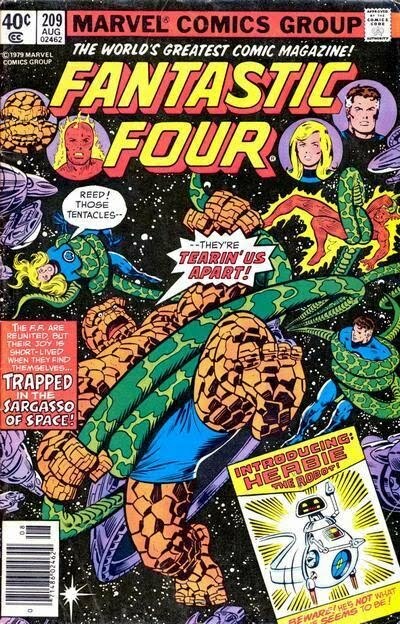 One episode of the series -- "The Challenge of Dr. Doom" (based on Fantastic Four #5)- was adapted directly from Stan Lee's script and Jack Kirby's storyboards for the backup story in FF #236. HERBIE Mark II and HUBERT were created by John Byrne (who, ironically, drew HERBIE Mark I's first comic book appearance in FF #209). HERBIE Mark III was created by Scott Lobdell and Alan Davis. HADLEY was created by Joe Casey and Paul Pelletier. Robert Herbert Marks III was designed Mark Bagley. Marks' appearance was patterned after that of famed anime character Astro Boy. "Life is not slowing down around these parts..."